Scotland made it two wins from three in the Six Nations under-20 championship after achieving a 24-14 victory over Italy last night at the Plebiscito Stadium in Padova despite playing 60 minutes of the match with 14 men. 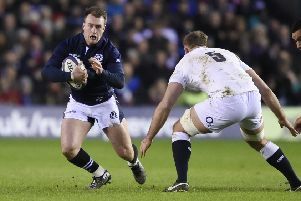 The young Scots suffered two sin binnings with yellow cards shown to stand-off Rory Hutchinson and prop Callum Sheldon, the latter penalised for repeated infringement as Scotland struggled at times to cope with the muscular Italian forwards. Scotland led 17-7 at the break from tries by Hawick wing Darcy Graham and prop Murray McCallum both converted by Hutchinson who also kicked a penalty goal. A penalty try awarded to Italy after repeated scrums on the Scotland line brought the Italians back into the game but the Scots, despite the sin-binnings, finished strongly to score through replacement wing Robbie Nairn scrum half Hugh Fraser adding the conversion.